Brew your own beer! Too complicated? 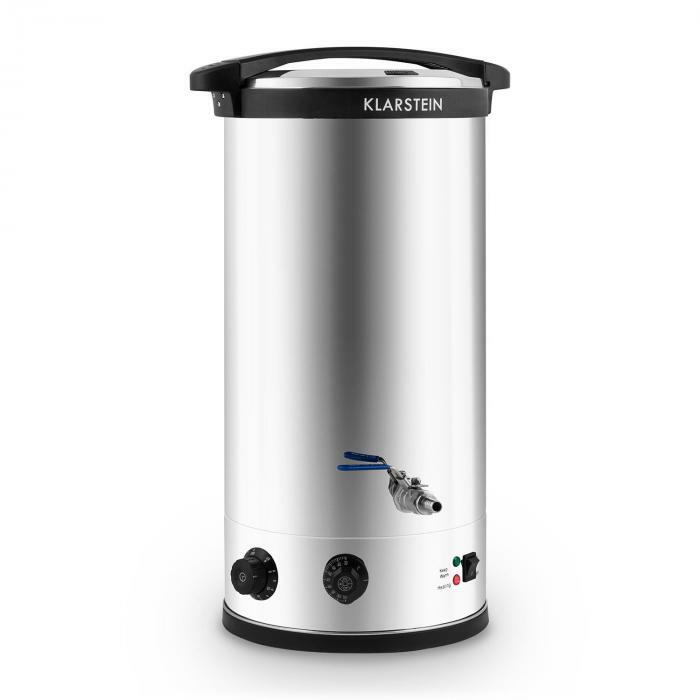 Far from it, with the Beerfest Mash Kettle from Klarstein easily turns anyone into a master home brewer, The most complicated part of beer production is mashing. The grist must be precisely heated and maintained at a uniform temperature over long periods of time in order to convert the starch of the grain into fermentable sugar. The process is made easy in the mash kettle. 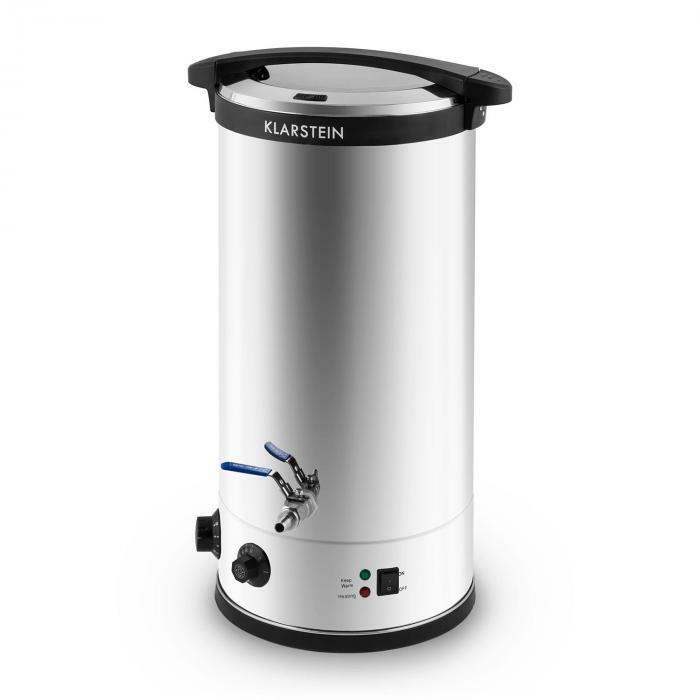 Up to 30 litres of brewing contents can be brought to a boil in a large stainless steel bowl. Using a variable control, the required temperature can be accurately set in two-degree increments between 30 and 100 degrees Celsius. 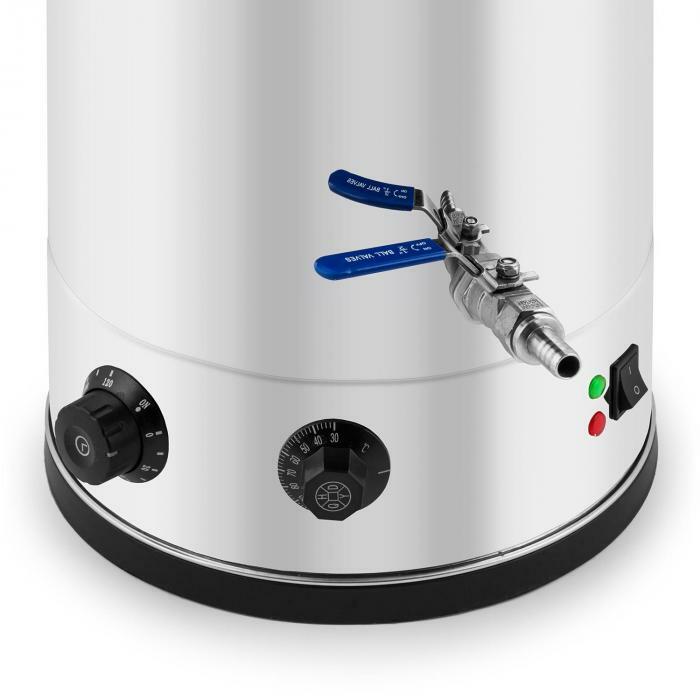 The powerful 2585W heating element brings the mash to a boil to reach the desired temperature in the blink of an eye. Two operating lights show whether the Beerfest brewing unit is heating (red light) or maintaining the temperature at the desired level (green light). Via an additional knob, you can set a timer between 10 and 120 minutes. An acoustic signal announces when the time is up and the heating element switches off. This ensures that you miss none of the important points of temperature change in making your brew. The mash boiler can also be adjusted on continuous operation. 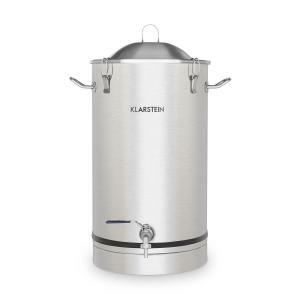 The double-walled stainless steel bowl of the Klarstein Beerfest mash kettle helps the process in several ways: first, it provides a uniform temperature distribution so that the brew in the bottom and the upper part of the tank reach the same temperature. 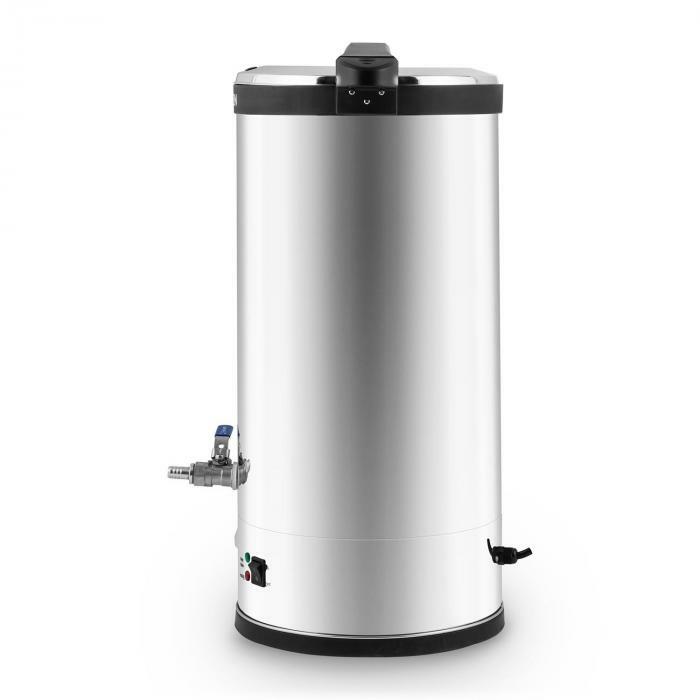 It also increases safety, preventing the exterior of the brewing unit from excessively heating and therefore reducing the risk of injury from accidental touches. Also, the stainless steel surface facilitates the cleaning of the inside and outside of the device after mashing. Finally, the polished exterior makes for an eye-catching device in your home brewery. When the brew is ready, a coarse sieve and mesh hose filter help remove the grist from the mash. Via a 1/2” tap on the bottom, the brew can be drained. A lock prevents the accidental opening of the tap. Two brews done now I'm the Beerfest and while it's a little basic it does what it does very well indeed. Yes, the temperature control is a bit of a bang-bang control (but pretty accurate and has a sensible hysteresis) but it's very well insulated, pretty quick to heat up (2.5 kW into 5gal is going to take a bit of time because, well, physics) and super easy to drain and clean. Ideal for the novice/intermediate brewer on a budget. I'm thinking of getting a second one to double my throughput! A great cheaper alternative to far more expensive products out there. The lid can be finicky to use, but in honesty i leave it off during the wort boil as i just love to smell and see the hops going crazy, lol. Use the liner for the wort grain as its far easier to handle the spent bed. As mentioned in the other review a digital cook thermometer is recommended as this basic entry mash tun uses a mechanical temperature setting, but it is accurate, to be fair. The double strainer can block with the hop detritus, so either put them in a bag, or have a length of hose ready to syphon off the chilled down wort. This is a fantastic product for the home brew enthusiast - and excellent value for money. 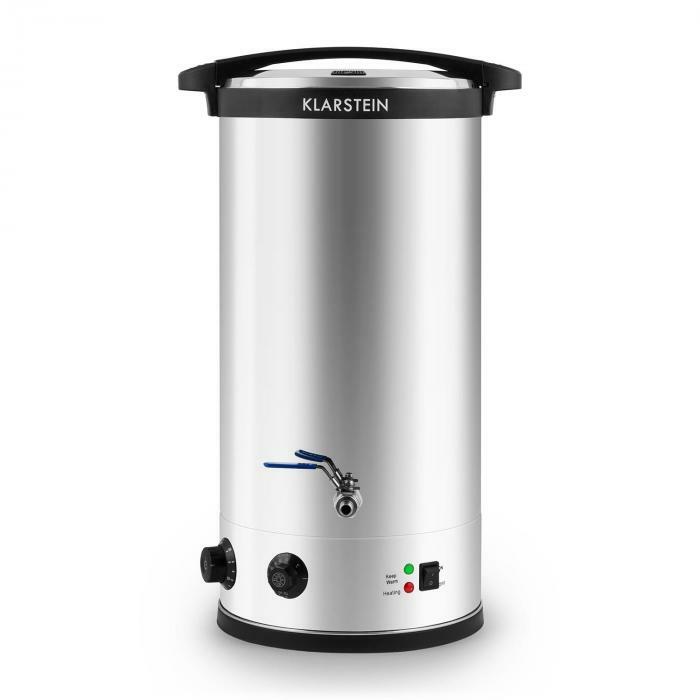 The insulation provided by the double stainless steel skin makes it ideal as a mash tun as well as for the boil (so you just need the one vessel - saving space too). 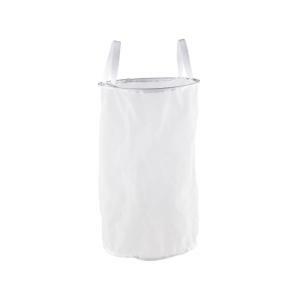 It's design is both robust and simple, making it easy to clean, and it's slim profile makes it easy to store when not in use. It's worth using with an electronic oven cooking thermometer (I find that the heat proof wire of the one I use is easy to pass through the lid seal) for maximum control of mash temperature. Since starting to use this kettle I have realised that it's insulated design also makes it ideal for post boil hopping. I've already made some great beers by allowing the brew to steep overnight - just fit the lid as the boil finishes, so you ensure a sterile environment, and it can gently steep the wort for hours before you bring it down to pitching temperature. In summary, it's a great, simple, good looking piece of kit that's excellent value.